On April 2nd, 2013, at 18 ½ years old, it was time to let Rocko’s tired worn out body go. We had a good life together and he was ready. 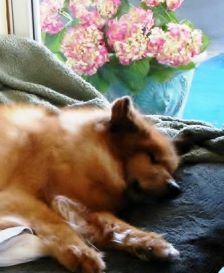 His last days were very peaceful and full of love, now he is free. We found Rocko in 1995, abandoned on the side of the road in rural Mississippi. His story was a family legend and the inspiration behind Rocko’s Rewards all natural dog biscuits. To hear it from his point of view, read Rocko’s Story. It was a good life. His legacy will live on.